all went up town to do shopping We got out Fannys carpet rags and began work on them. Father came over to stay till after supper. weather cool enough for a fire. Friday May 26th 1893 It was a rainy drizzling day. I worked all day fixing the waist to my green dress. Fanny helped me in the morning. Hattie and Edith were over in the afternoon and the girls went to a meeting. We sewed on the carpet rags in the evening. Saturday May 27th 1893 Fanny was not at all well but got up by noon. She worked at the rags what time she felt able to work at any thing. I went up town soon after dinner to get things for Sunday. I helped with the rags some too. Hattie was here in the evening. It was a beautiful day after the rain. 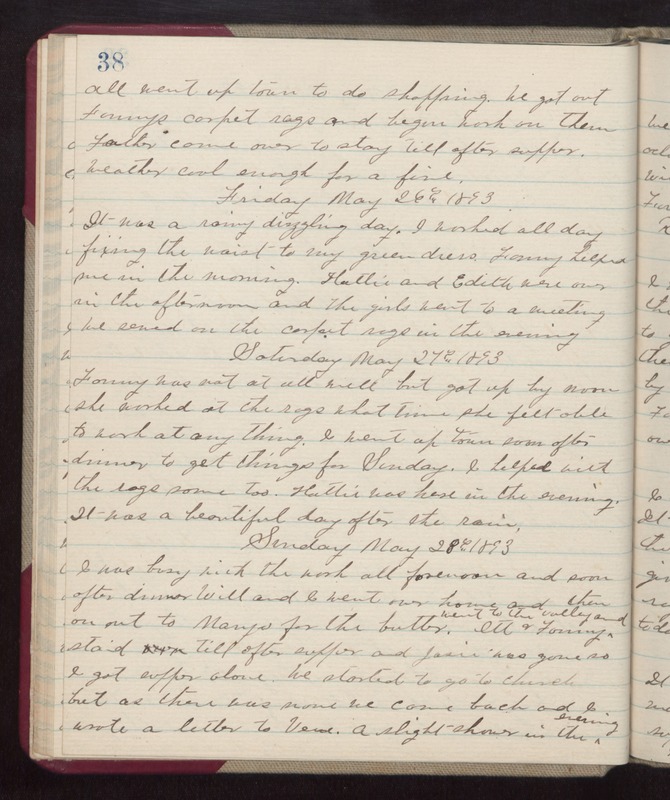 Sunday May 28th 1893 I was busy with the work all forenoon and soon after dinner Will and I went over home and then on out to Marys for the butter. Ott & Fanny went to the valley and staid til after supper and Josie was gone so I got supper done. We started to go to church but as there was none we came back and I wrote a letter to Vene. a slight shower in the evening.